Sen. Amy Klobuchar of Minnesota signaled on Tuesday she could become the next Democrat to enter the presidential contest, teasing a major announcement on Sunday in Minneapolis. "Come to Boom Island in Minnesota ... and you'll find out," she told MSNBC host Rachel Maddow. "Then you'll find out my decision." She didn't offer further details about whether the event would serve as a formal campaign launch. If she enters the race, Klobuchar would likely use her Minnesota roots to make a strong play for the Midwest. The region backed Democrats in presidential contests for decades, but slipped away in 2016, playing a critical role in President Donald Trump's victory. Democrats have made it a top priority to recapture Michigan and Wisconsin in 2020 to winnow Trump's already narrow path to re-election. 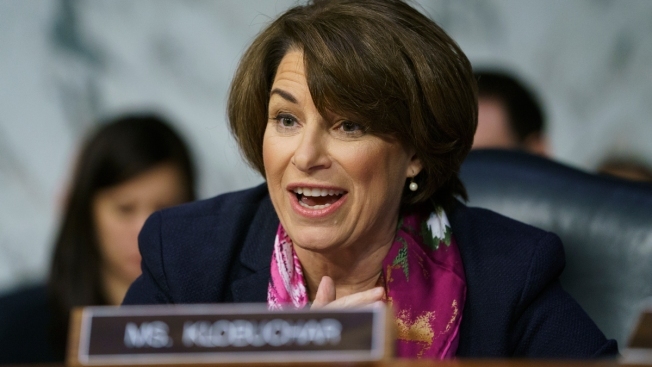 Underscoring her focus on the Midwest, Klobuchar already plans to visit neighboring Iowa, home to the nation's leadoff caucus, later this month. Klobuchar is a third-term senator who overwhelmingly won re-election last year. On Capitol Hill, she's known for her legislative productivity and genial demeanor. The 58-year-old former prosecutor has won acclaim for her style of questioning of high-profile nominees who appear before the Senate Judiciary Committee. During Brett Kavanaugh's Supreme Court confirmation hearing, she pressed him on whether he ever blacked out from alcohol use. He combatively threw the question back at her, for which he later apologized. She would be the fifth Democratic senator to enter an already crowded primary. Sens. Elizabeth Warren of Massachusetts, Kirsten Gillibrand of New York, Kamala Harris of California and Cory Booker of New Jersey have already entered the race. Other prominent Democrats, including former Vice President Joe Biden, former Texas Rep. Beto O'Rourke and Vermont Sen. Bernie Sanders, are expected to announce their 2020 decisions soon.